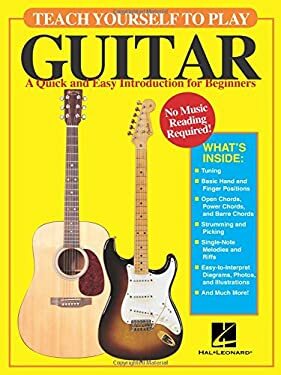 Teach Yourself to Play Guitar has been created specifically for the student with no music-reading background. With lesson examples presented in today's most popular tab format, which also incorporates simple beat notation for accurate rhythm execution, Teach Yourself to Play Guitar offers the beginning guitarist not only a comprehensive introduction to essential guitar-playing fundamentals, but a quick, effective, uncomplicated and practical alternative to the multitude of traditional self-instructional method books. It also: covers power chords, barre chords, open position scales and chords (major and minor), and single-note patterns and fills; includes lesson examples and song excerpts in a variety of musical styles - rock, folk, classical, country and more; familiarizes the student with fretboard organization, chord patterns, hand and finger positions, and guitar anatomy by way of easy-to-interpret diagrams, photos and illustrations; provides complete, concise explanations while keeping text to a minimum; and prepares the student for the option of further guitar instruction.